Mesoscale Convective Systems (MCSs) occur globally and can account for significant percentages of the annual precipitation in some locations. MCSs are responsible for flooding as well as damaging surface winds in some instances. Thus, it is important for forecasters to understand when, where, and how MCSs develop and maintain themselves. This module covers all modes of MCSs with a strong focus on the tropics and the different aspects that brings to MCS development, maintenance, and structure. It describes conceptual models of MCSs and the dynamical and physical processes that influence their evolution. Also included are examples of MCSs from various areas of the tropics. A bit more on forecasting MCC/MCV movement would be nice. Otherwise, a good treatment of a complex subject. Great topic; lessons prepared me for the quiz! 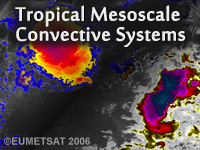 This lesson presented a clear and detailed explanation of the dynamics of tropical mesoscale convective systems. It was very helpful in expanding my meteorological knowledge. Great lesson, didatic and with a coherent quizz ! Identify key dynamic and thermodynamic environments favorable for each type of MCS, including favorable large-scale environments.